Published: April 2, 2013 at 05:33 p.m. 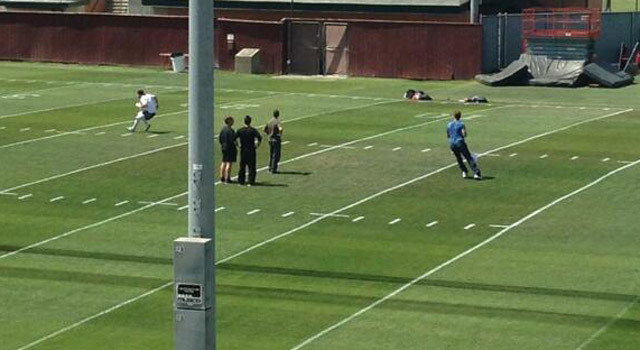 Updated: April 3, 2013 at 09:13 a.m.
Tom Brady worked out with new Patriots wide receiver Danny Amendola on Tuesday at USC. Attention heartbroken New England Patriots fans tired of drying their tears into useless Wes Welker jerseys: Tom Brady is working on his connection with the team's next slot receiver. USC Athletics tweeted out Tuesday that Brady and new Patriots slot receiver Danny Amendola were working out at its facilities. Brady annually works out in Los Angeles. Football players practicing football in the offseason isn't exactly breaking news, but this is the best we can do on April 2. We've even got photographic evidence from another member of the 2000 NFL Draft quarterback class, USC receivers coach Tee Martin (as seen above). Yup, the Patriots completely are changing their offense this season.